This project was really quite quick, but might also make a great gift, especially if paired with those potholders from the other day! I’ve been trying to use up some of my small scraps, since it’s been getting a little out of hand! Like many others, I have a hard time throwing away fabric, even the smallest scraps, and as a result, I have a huge container filled with some pretty small scraps. 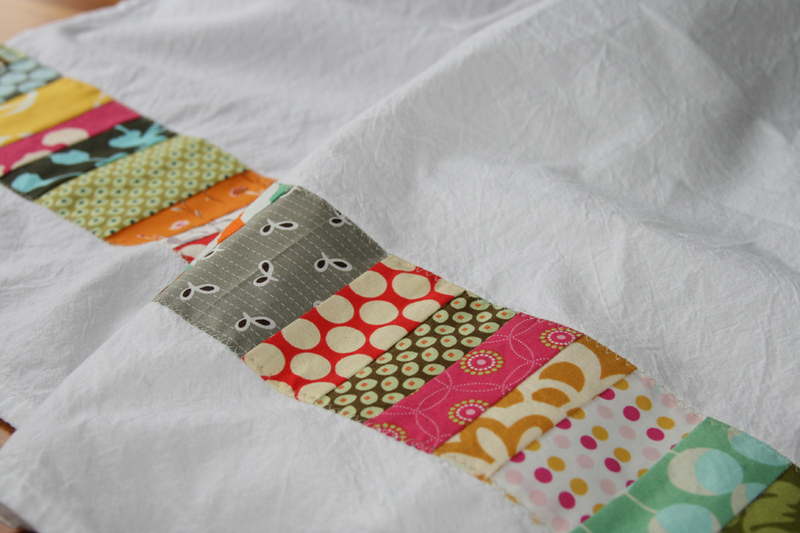 For this project I pulled out scraps that were about 3″-4″ long with varying widths. 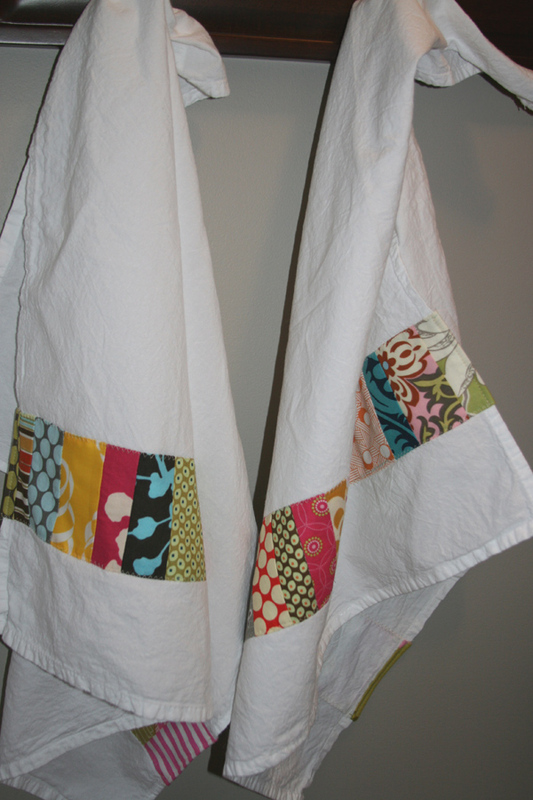 I wanted to add some color to these plain white dishtowels. These are Martha Stewart flour sack towels, which I bought at Kmart some time ago. I love them as towels, but frankly, they’re a little boring as is… a bit of color is just what they needed! To make these I sewed the scraps I had selected into a long strip, long enough to cover the width of the towel, with about an inch overhang on either end. I decided I wanted a strip about 3″ wide, so I marked a straight line on the top and bottom edges and folded and ironed along those lines to create a nice straight, clean strip. I then pinned this strip to the towel. I decided to sew it about 4″ from the bottom edge of the towel. I used a zig zag stitch to sew down the length of the strips. 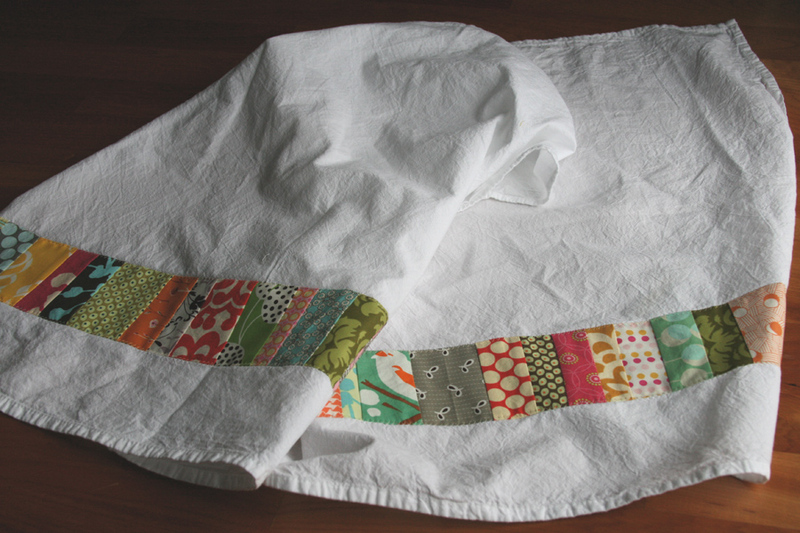 To ensure that it stayed in place during washing, I also stitched in the ditch every couple of blocks. 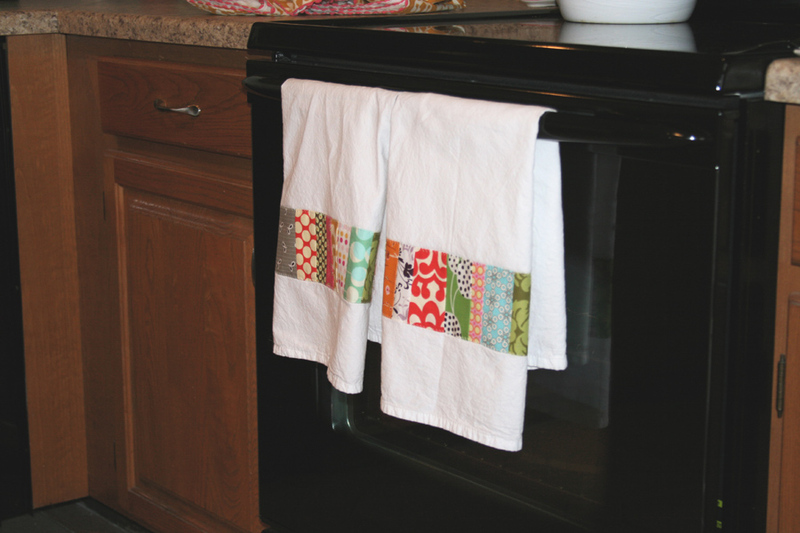 And now you have some fun towels – just enough to add a little color to your kitchen! This entry was posted in Household Goods and tagged Amy Butler, dishtowels, flea market fancy, flour sack, patchwork, Towels. Bookmark the permalink. What a super way to use up scraps. I too hate throwing away fabric and have the smallest pieces!! So believe me you are not the only one – I just need somewhere to store all my scraps as they are overflowing all over the sewing table. Great towels! I have been saving those little pieces of fabrics too, with no idea on how to use them. Sometimes I think I should just let them go, but now I’m glad to see how you used them up. Love it! i was shopping for some towels like this to add to my mom’s potholders, but couldn’t find a thing. maybe my local kmart will have these. the one place i didn’t go! thanks for the tip. they look fab! These are gorgeous! You always put together the best color and fabric combos, I love them! I’ll be linking! What a great idea! I love those towels but you are right-they are boring. These would be cute in a gift basket of kitchen items. that is a great idea! I love your new towels. I LOVE your idea for towels! They are super cute! Love these! I just went through all my scraps yesterday and sorted them into stacks. That’s not sad at all is it?! This will be a great use ’em up project! Stinkin’ ingenious! I love this idea… will be trying it out soon! But first – to Kmart! I love this!! 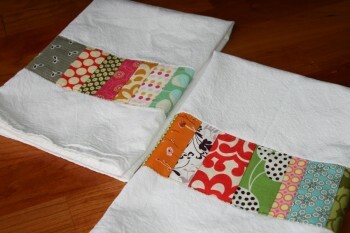 Great idea and perfect way to use scraps. I love this. Thank you so much for sharing! I would be honored if you would link up your super cute blog over on my blog stalkin’ page. This is the perfect project for using paper piecing on the wide calculator paper. Inexpensive and makes it easy to trim straight.